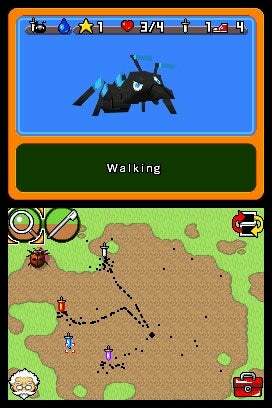 Konami's Nintendo DS game Ant Nation raises some serious questions about ethics, aliens and why you'd want to craft a strategy game around pests. 1) The "alien ants" as well as other insects are actually robots that aliens have sent to Earth to attack your colony. 2) The game isn't coming out in July; it's got a "Summer 2009" release date. The game has a mission structure that "slowly" opens up as players beef up their colony. The ants have three resistances (water, fire, poison) that you can build up which act sort of as a rock-paper-scissors battle mechanic: water-tough ants can beat fire insects, etc. Also, the DS version will have multiplayer. The ethics are what bug the most (pun intended). Players are supposed to toughen up their ant colonies by torturing them with flames, a magnifying glass or water so that they're better able to fight off other insects that compete for random food items left all around different environments and alien ants that invade the colony. That's another thing: why would aliens invade Earth in the form of ants? You'd think just about any other creature would be a more effective means of taking over a planet – even a praying mantis would be more menacing. But I suppose every strategy-minded gamer has to start somewhere; if they happen to be below the age of 12, it might as well be with Ant Nation. And when you think about it, strategy games on the DS usually wind up being about pixel management; so it really doesn't make much of a difference between marching ants and marching armies. Ant Nation is a strategy game where players build an ant colony, beef up their worker ants and fighter ants by foraging for food (and torturing them) and eventually take on missions to destroy other insects and alien ants. I sat with Ant Nation for about twenty minutes, building a colony, going on missions to fight the alien ants and foraging for sugar cubes. The game is due out July, which means there might be more time left for graphics polishing – I hope. So Not Cute: Ants are already tiny creatures and not very cute in real life. So reducing them to the size of a pixel that's smaller than a real ant is not the best way to encourage the player to form an attachment to their army. The game tries to compensate for this by giving the ants little voice bubbles that indicate their emotions (happy faces, etc.) – but it's still not very cute. Not So Compelling: Missions in Ant Nation are activated by sending forth your ants to nom on blue boxes. Once a box is destroyed, the mission is activated and it usually involves sending more ants out into the field around the anthill to attack alien ants. I'm not saying strategy games need a strong plot to move the game forward; but it'd be nice to have a little structure – or maybe a consistent threat of alien ants – to make the player advance in the game. Ants Don't Squeak: Stop trying to confuse me. Varied Maps: There are several different areas where you can set up your ant colony – a field, a volcano, whatever. Each area presents a different level of challenge depending what environmental hazards there are for your ants to overcome to forage the map for food and mission boxes. Easy-to-Handle Controls: The game is intended for kids – it can't be complicated, even if it is a strategy game. Simple stylus taps and double-taps get most things done, and the screen-switching toggle that allows players to move between the inside-the-colony view and the overall area map is never hard to find or activate. Even if the premise is whacky and the ants aren't cute enough to overcome the boring nature of pixel-management games, I'm glad that there is a strategy game that's designed for children. It may not work out so well on the DS, but after getting a brief look at the WiiWare version (which has way cuter ants), I'm at the very least hopeful that one of the Ant Nation games won't be a complete waste of time.